If you're wondering how Golden Rod, Ragwort, and Devil's Bit got their names, how Dandelion can be used to treat liver disorders, or how Horseradish staves off scurvy, look no further than A Modern Herbal. 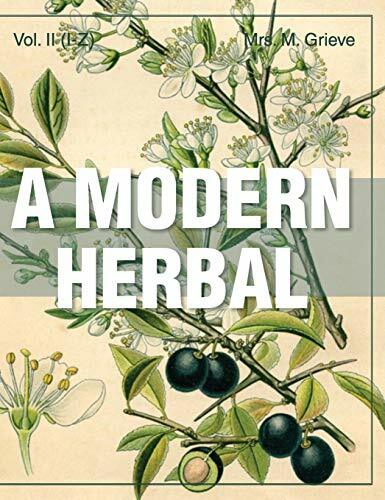 This modern reboot of the medieval herbal improves upon its predecessors with meticulously researched scientific support and pages of recorded folklore about each entry. Encyclopedic in coverage, A Modern Herbal covers every herb, grass, shrub, fungus, and tree you can think of, from to Abscess Root to Zedoary. Building on the traditional herbal, which combines folklore about the plants, their medicinal properties, anatomies, and botanical classification, Mrs. Greives has compiled a one-of-a-kind encyclopedia of more than 800 varieties of plants. The entries are neatly and thoroughly filled with seemingly boundless amounts of information on cultivation methods, chemical constituents, dosages, preparations of extracts, tinctures, and foods, as well as cosmetic properties, and beautiful, detailed illustrations. Also included are hundreds of recipes for lotions, ointments, sauces, wines, vinegars, brandies, and prescriptions for tonics and liniments to combat just about any ailment.